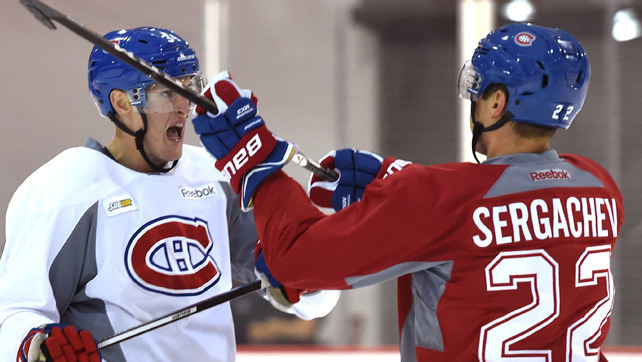 BROSSARD – The Canadiens have themselves a very special player in Mikhail Sergachev. On Thursday morning, the 18-year-old defenseman closed out his development camp experience in style, notching the game-winning goal in Team A’s 4-2 scrimmage victory over Team B at the Bell Sports Complex with plenty of fans looking on from the stands. Once again, Sergachev was among the smoothest skaters and most deceptive stick handlers on the ice. That really was the case all week long. He stood out from the crowd with his relentlessness, creativity and remarkable overall skill set for a player his age. Director of player development Martin Lapointe couldn’t say enough good things about the Canadiens’ first-round pick in 2016, who turned his fair share of heads over the last six days in Montreal. “He made a really good impression. We saw just how physically strong he was. He’s only 18 years old. He’s got a bright future ahead of him. His level of confidence with the puck is exceptional. He’s calm with the puck. He skates with it up ice at the right time and he defends well. His compete level is very high. Doing all of that at 18 years old is very impressive,” praised Lapointe, referencing Sergachev’s noteworthy composure going up against many young guns boasting far more experience in these types of camps than he does. Equally as impressive was Sergachev’s willingness to engage with towering forward Michael McCarron during scrimmages over the last two days. The pair squared off on several occasions, chirping at one another repeatedly in the heat of battle and while going to their respective benches. McCarron might have a few inches on Sergachev in the height department – and a few pounds on him, too – but that didn’t stop the ninth-overall pick this past June from going head-to-head with the imposing centerman. McCarron, meanwhile, already has a great deal of respect for what Sergachev is capable of. He is adamant that the Nizhnekamsk, Russia native has an extremely bright future ahead of him with the Canadiens. Based on everything Lapointe saw from the Canadiens’ newest prized pupil, the two-time Stanley Cup champion wouldn’t be at all surprised to see him patrolling the blue line in the NHL sooner rather than later. In fact, Lapointe didn’t rule out the possibility of Sergachev earning a roster spot in Montreal in October. With rookie camp – and main camp – on the horizon in September, Sergachev will return to Russia in the meantime to train with 19-year-old defenseman Ivan Provorov, the seventh-overall selection of the Philadelphia Flyers in 2015, and his strength coach in Yaroslavl. He knows that there are a few areas of his game that still need fine-tuning, and he plans on addressing all of them while overseas. 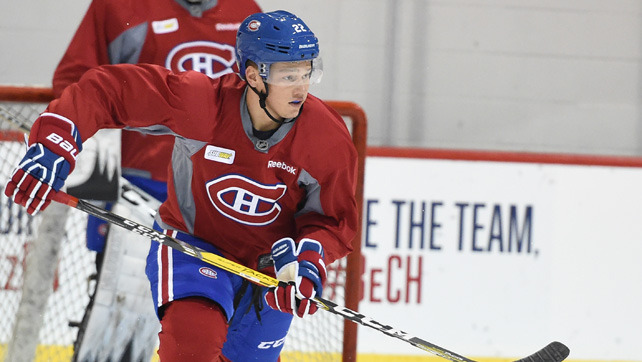 A hard worker in his own right, Sergachev plans on putting all of his development camp knowledge and experience to good use back home before returning to Canada to ultimately make his case for a spot with the big club in 2016-17.